Participatory Budgeting (PB) is about local people having a direct say in how public money is spent. better able to take decisions on where public funds are spent. PB will only be effective in achieving change if done with and not to communities. Since 2015, PB can be characterised by the dispersal of relatively small amounts of public money within a community (small grants) or by, increasingly, communities having a say in deciding where larger sums of public money are invested in pure public services and infrastructure (mainstreaming). Ideally, PB should combine community involvement in small grants models with the potentially more far-reaching mainstreaming models. Both can exist side-by-side and support each other. PB is an approach to community engagement and empowerment amongst others. Like other approaches it can be done well, or not. The outcome depends on the purpose, planning and level of community involvement. Good PB should be guided by the National Standards for Community Engagement. When done well, voting events can be joyful celebrations of the good work happening in communities and an opportunity for groups and services to attract community support. PB brings people together to start conversations, leading to relationships that make our communities stronger - building skills and confidence to go on and become more engaged. The more PB is co-produced with communities, the more transformational it becomes and there's more needs to be done to ensure that PB includes genuine deliberation and that all parts of our communities benefit from PB, especially those most at risk of being marginalised in society. The Big Celebration event on Friday 7th December, at The Inkwell, Elgin, was a joyous occasion where everyone who was involved in tsiMORAY’s latest PB programme had their achievement celebrated. Fiona Garven, SCDC Director, is joined by Evelyn O’Donnell from Glasgow City Council and Rosie Ilett from Child Poverty Action Group to talk about how participatory budgeting (PB) is developing in Glasgow. PB Scotland acts as a hub for sharing and learning about the great work being done by PB initiatives around Scotland. It provide updates on events, policy and resources relevant to PB in Scotland, and profile good examples of PB in action. Please get in touch to tell us about your PB work and help us share it more widely. PB Scotland has been developed by Scottish Community Development Centre with funding from the Scottish Government. A special thanks to Leith Neighbourhood Partnership for providing photos from the £eith Decides PB initiative. Photos taken by Vanessa Roy. Expert advice is also provided by Jez Hall and Alan Budge from PB Partners. 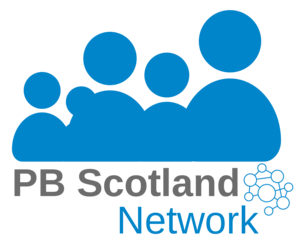 For more information on the PB working group please contact info@pbscotland.scot.